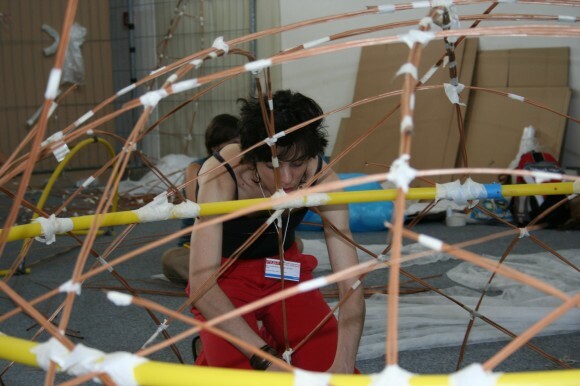 On the day of the opening ceremony of the Prague Quadrennial 2007, the first workshop finished. It had to, because its purpose was to create a set of massive flying objects for the opening ceremony. I was on that workshop, and here follows an account of what went on in the two days running up to the opening of PQ 2007. On the morning of the 12th of June, the participants of the workshop entitled Reaching For The Heavens met for the first time. Like all groups of strangers we didn’t know who to talk to, and so most of us kept quiet. The workshop was made up of about twenty to thirty girls, and three boys, of which I was one. Peter Farley, the organizer of this workshop, arrived at 10:30am, and briefly outlined our task. We were to design and build a set of large objects, which would be brought into the Central Hall and flown around the Babel Tower during the opening ceremony. We had two days to do this. The emphasis, Peter explained, was on creating a unifying performance, where all objects would work together as one. It was not a competition, he said, where each group was to try and outdo the other groups. However, competition may well be a character trait that is inseparable from designers. Of course we all understood that everything had to work together and each piece had to be an inseparable part of a whole, but I got the feeling that each participant wanted their piece to work together better than everyone else’s, and wanted it to be the most individual inseparable part of the whole. Nevertheless, we got to work straight away. Two days is not very much time to design and build an object from scratch. A large roll of paper was laid out on the ground, each group were given some marker pens, and were instructed to begin by drawing and sketching ideas. Instead, my group began by having a communication breakdown. We were a group of five, from Ireland (me), Slovakia, France, Poland and Italy. While we all knew the common language of English, some knew it better than others, and some found it frustrating to try and express ideas with a limited vocabulary. Yes, I was very frustrated. After a while, however, we fell into a kind of lingual rhythm, and we began to understand each other better, or at least were better at pretending to understand. We sketched ideas, including a series of concentric circles, a miniature Babel Tower, and an astronaut in a suit. Eventually one of our group threw down a picture of a beetle, and for lack of a better idea we decided to make an enormous beetle. I don’t think you can call something an influence if you decide to copy it directly. But we didn’t care, we were happy to finally have a direction to go in. we fell into a kind of lingual rhythm, and we began to understand each other better, or at least were better at pretending to understand. One group began by making a model, so everyone decided to make a model. What started out as a move not to be outdone turned out to be a really good idea, because it instantly showed up many of the problems that we would have to face. For one thing, none of us had much experience in constructing objects from materials commonly found in DIY stores. My group were mostly architecture students, who long ago gave up the idea of building actual models, and rely largely on computer models. In fact, I was the most experienced in terms of construction, and the depth of my knowledge could be summed up in a postcard. The odds were stacked against us, but we didn’t care. We were designers, and therefore we were invincible. Also, we had help. Peter Farley designs shows at the Royal Opera House in London, and they don’t let just any idiot do work for them. So he probably knows a thing or two about design and construction, and he had seen fit to assign helpers to the groups. There were three for our workshop, dividing their time equally between the groups. They knew how to do the things we wanted to do, and were able to show us how to do them. So what did our group really want to do? We had an ambitious plan. We wanted to create a giant mobile of an exploded beetle, where the beetle was divided up into separate parts such as arms and legs, and hung separately. Each part would be somehow joined with strings or wood or poles so that they would at least move together, and create the impression of a beetle still working. And what about the other groups? 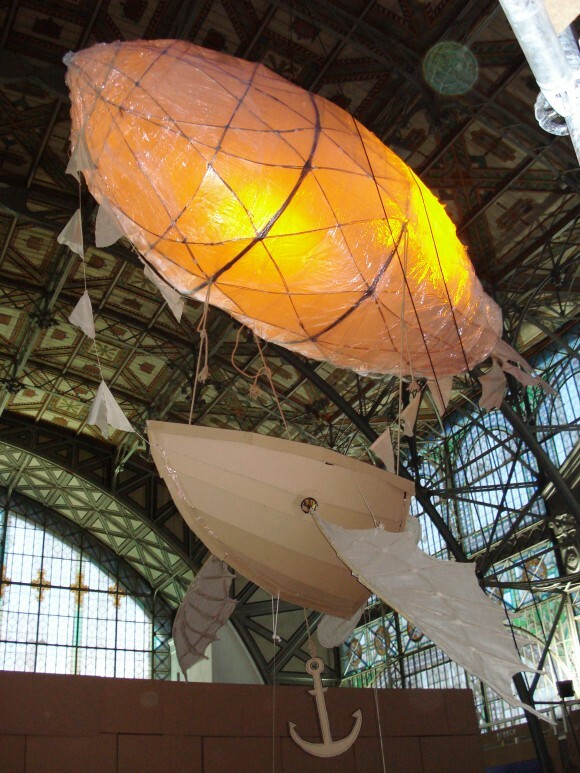 They decided to do a flying boat with wings, supported by a zeppelin, a flying house with a cyclist propelling it from below, a giant jellyfish raised up by helium, a flying dress, a penguin trying to fly with broken umbrellas and a large dome raised into the air with the sky painted on the inside, and a ladder rising into it. The next two days were hard work, and while the workshops officially began at 10:30am, most of us arrived much earlier, not because we were eager beavers, but just because there was so much to be done. Most of the morning work was done with hangovers. We had to simplify our design, as did most groups, because there wasn’t enough time or materials to do what we wanted. My group eventually decided to piece the beetle together into one, and to support it on stilts, rather than fly it into the air. This was much easier, but still quite hard. Although people say that if a beetle were the same size as a human it would be fifty times stronger, our beetle was much bigger than a human and was about as strong as a hamster with a heart condition. Our main problem was keeping it together for the duration of the performance. At 2:00pm on the 14th of June, some of us were finished, but most of us still had some work to do. However, we were all ushered out of the building, and told we would not be allowed back in until 6:30pm. This was bad news for my group, because we weren’t done, not by a long shot. I managed to get back in an hour later just by being lucky, but the rest of my group were not so lucky. Which meant I had to finish the project on my own. The other groups immediately adopted Peter Farley’s vision of a unified design to help me get my own work done, and by 6:30pm, when my team strolled in after an afternoon of lazing in the sun, we had finished the beetle (now a ladybird in reverse with the addition of red dots on a black shell), rehearsed the performance, and drunk a free beer, kindly provided by the barman who was testing the pumps. All that was left for my group now was to sample the free food, drink some more beer, and wait for the ceremony to begin. Our performance was originally scheduled for 8:00pm, and in typical PQ fashion was changed to 9:00pm without warning. This was irksome, because the free beer was running out, and we couldn’t enjoy it properly until the performance was over. But we were professionals, so we didn’t mind, much. Eventually 9:00pm came, and we took our positions. The ladybird went first, followed by the zeppelin boat and the penguin. We marched through the crowd, while people took photos and wandered in and out of our procession. The objects to fly were let up into the air, and the audience were suitably impressed. Afterwards we returned to our original positions and received our applause. Altogether it was a successful performance and a successful workshop. There was only one snag! by the time our performance had ended, the free beer had run out. Damn. Reaching for the Heavens – Scenofest 2007 from Scenography Website on Vimeo.